The wireless speaker market is saturated. No matter what size, shape, colour or power level you want, you can find it. If you really want to make a splash, though, you have to find ways to stand out. The latest entry into the space is another new offering by JBL. The JBL Charge 4 is a cylindrical, wireless, rechargeable Bluetooth portable speaker with 30 watts of power. 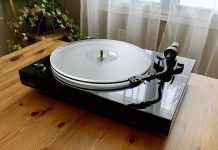 How does it sound and is it a good buy? I had a chance to spend a week with the device to find out. JBL Charge 4: What’s in the Box? The contents of the box are appropriately slim; you’ll get the speaker plus a Type-C USB cable for charging, and the associated paperwork. 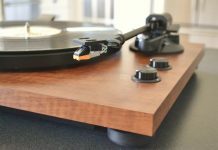 The speaker is super simple to set up and use. 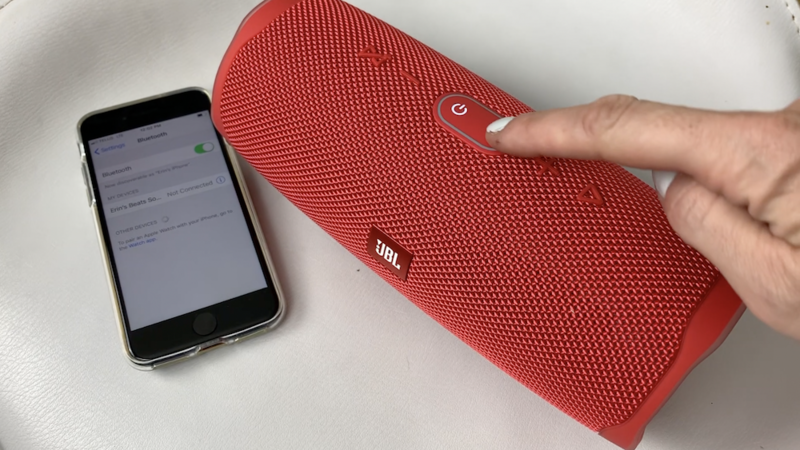 Turn it on by pressing the “Power” button along the top of your JBL Charge 4 Bluetooth speaker, then press the “Bluetooth” button along the top of the speaker next to the Power button. The Bluetooth button will start flashing, and you’ll hear a pinging sound. Go to your Bluetooth settings and look for “JBL Charge 4.” Tap to connect. The JBL Charge 4 will make a sound after a successful connection. Does JBL Charge 4 have Alexa/Google connectivity? A major feature manufacturers are building in is voice assistant control, but sadly here JBL is lagging. There is no Google or Alexa connectivity built in. I feel like that’s a bit of an oversight here, particularly with a speaker that’s so fresh on the market. If you want to talk to your speaker or use the speaker to control your smart home, you’ll need to choose a different device. One of the handy features of this speaker (though one I have yet to actually use) is that you can use it as a power bank. Just connect your cable to the USB in the back and you can juice up your phone or tablet in a pinch. 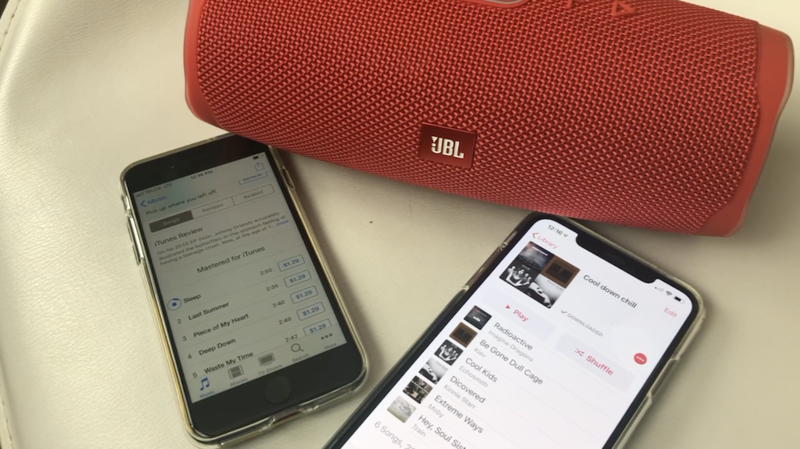 How’s Battery Life on JBL Charge 4? 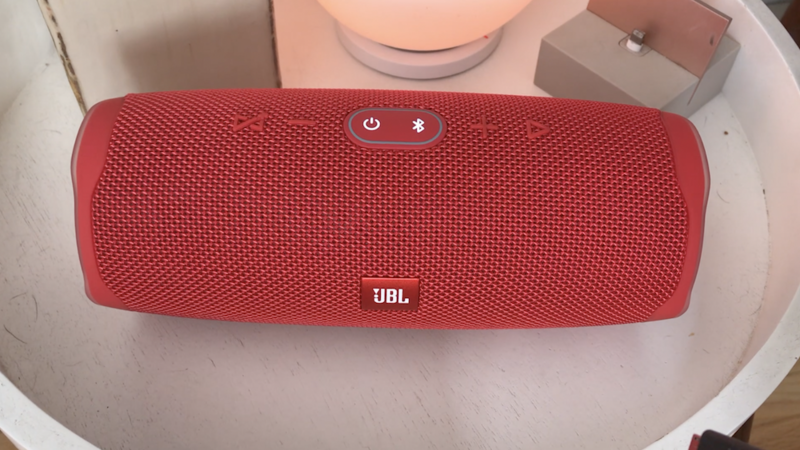 JBL has endowed this speaker with a built-in rechargeable Li-ion 7500mAH battery and says that should give the device up to 20 hours of playtime. Worth noting is that it takes about five and a half hours to fully recharge it, so be prepared if you’re heading off the grid. The speaker will power off automatically when it’s not in use, helping you save battery. The JBL Charge 4 allows you to connect up to two smartphones or tablets at the same time, meaning you can keep it connected and controllable from your phone and your tablet, or share DJ duties with a pal. This seems to work well though one phone can technically cut off the other one, so if you’re sharing, you’ll need to play nice. Another key feature of the Charge 4 is that it’s water-resistant. It has an IPX7 waterproof rating, meaning it’s protected from accidental submersion in 1 metre (3.3 feet) of water for up to 30 minutes. There’s no speakerphone on this speaker, which might be a disadvantage since most other portable speakers do offer that feature, but for me, that’s yet another feature I never actually use in practice, so I don’t really feel like I’m missing anything. The speaker does also allow for a direct connection to a device using the 3.5mm Aux jack, if you’re analogue like that. How does JBL Charge 4 sound? I was kind of “meh” on the JBL Charge 4 when I was getting ready to do the review and checking out the features. Then, I turned it on. Wow! The sound is incredible; the bass is out of this world, and it’s strong and rich. 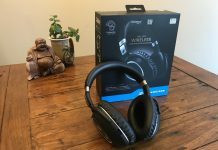 The overall sound quality is really great. Indoors it fills my living room/kitchen area with high-quality sound that’s even and doesn’t lean to either the high or low-end unnaturally. The speaker feels like it has lots of power and you can get pretty high volume levels too. Overall, what this speaker is lacking in smart assistant functionality it more than makes up for in sound quality. If you’re getting a portable wireless Bluetooth speaker for the sound, this one won’t disappoint. Find the JBL Charge 4 at Best Buy. 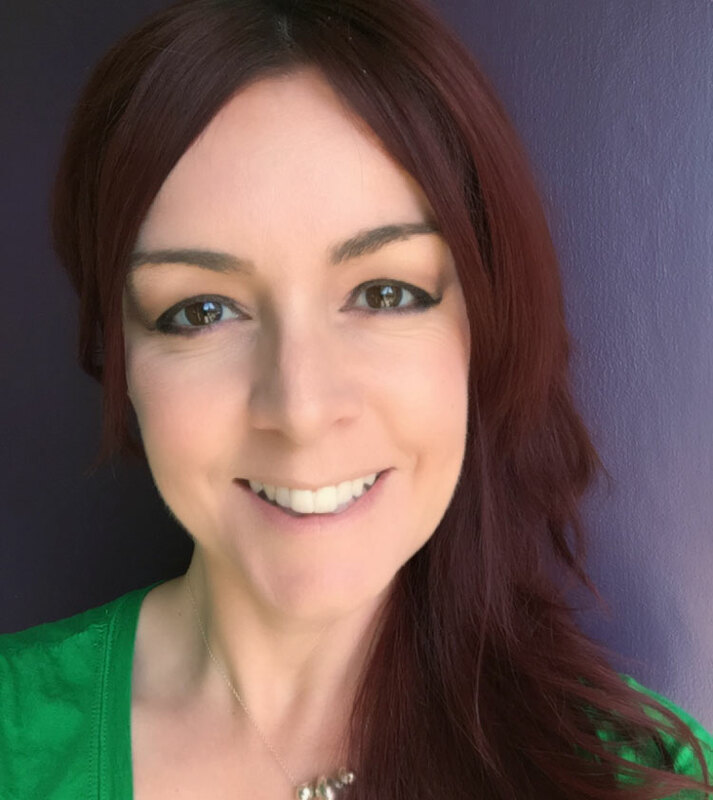 Erin is a journalist, writer, and TV producer with a fascination for technology and a love of gadgets. Watch her on Tech Talk, monthly on CTV Morning Live Calgary. 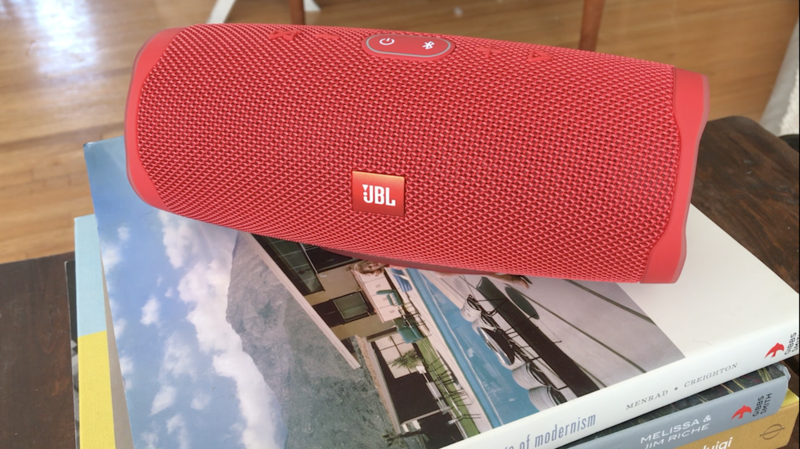 For my family, the JBL Charge 4 portable speaker would be perfect for the social and music components. Our stereo equipment is not in the living room, but it would be nice to have music there when company is over without lugging out the stereo rack! The portability of the JBL Charge 4 would also be great this summer for the Celebration Of Light fireworks festival to hear the choreographed music. One last thing we would use it for is each night in our son’s bedroom to beam lullaby music so he can sleep (without the light of a connected tablet / mobile phone)! So, it would be amazing to win such a great prize to enhance our lives! Hey Erin, the JBL Charge $ such like a great portable speaker. At home the whole family and our friends love board games, card games and love to have a little music in the background. Also if we have barbeques in the sunnier days it would be great to have music to listen to. Would love to win this great prize!